Skeeter Solutions can help protect your loved ones from mosquitos. Our eco-friendly mosquito barrier sprays keep your yard pest-free. Say Goodbye to Uninvited Guests. Stop mosquitos from showing up at your outdoor event with our family-friendly sprays. Safe and effective mosquito control for your home, business, or event. Call (251) 279-0345 today! Don’t Let Mosquitos Take a Bite Out of Your Fun. Enjoy your outdoor space without worrying about mosquito bites and mosquito-borne illnesses. Whether you’re hosting an event at your home or business, preparing your yard for summertime use or protecting horses and other livestock, Skeeter Solutions can help. 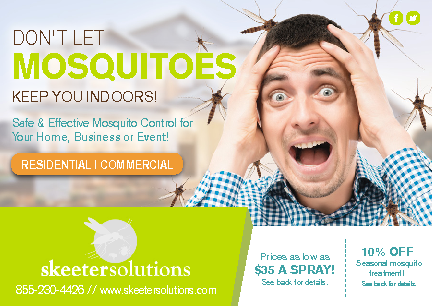 Kill existing mosquitos and prevent new ones from coming in by calling Skeeter Solutions. We’ll send out a highly trained technician to target common breeding grounds and entry points, locate existing mosquito larvae and use EPA-approved repellent to create a barrier that keeps pests away. Why Treat Your Property for Mosquitos? Not only do mosquitos make annoying guests on your property; they’re also vectors for illness and disease. Mosquitos are capable of carrying several strains of encephalitis, meningitis and the West Nile virus. People with compromised immune systems, including infants, toddlers and people over 50, are more susceptible to these mosquito-borne illnesses than healthy adults. Animals are easily infected with mosquito-borne diseases. While there are vaccines against encephalitis and West Nile virus for horses, the best protection is to limit their exposure to mosquito bites. Skeeter Solutions can help your family, your animals and your guests minimize the risk of contracting mosquito-borne illnesses through safe, eco-friendly methods. Mosquitos can (and do) breed in any moist environment. Bird baths, the cool shade beneath shrubbery and even gutters are ideal breeding grounds for mosquitos. Each of Skeeter Solutions’ technicians is trained to find mosquito breeding grounds and eliminate them. Call us to find out how we can prevent mosquito reproduction. It’s hard to enjoy your outdoor space when you’re constantly swatting away pests. Hosting a special event? We can spray several days before your wedding, party or other event to ensure your guests aren’t plagued by pesky mosquitos during the celebration. 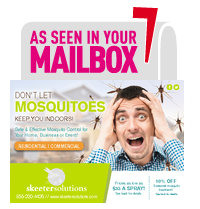 At Skeeter Solutions, we have the experience and technology to stop mosquito infestation in its tracks. We’ll use proven techniques that will effectively kill existing mosquitos and prevent new ones from taking up residence on your property. Skeeter Solutions treats residential and commercial properties, as well as municipal areas and farmlands. Our certified technicians will carefully inspect your property to evaluate your needs. From backyard patios to barns and pastures, Skeeter Solutions is your one-stop shop for mosquito removal and prevention. Call us at (251) 279-0345 to schedule your complimentary consultation today.